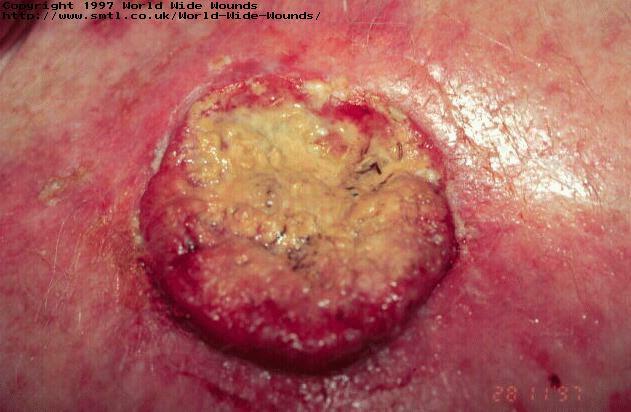 The use of sterile larvae (maggots) in a malignant wound. 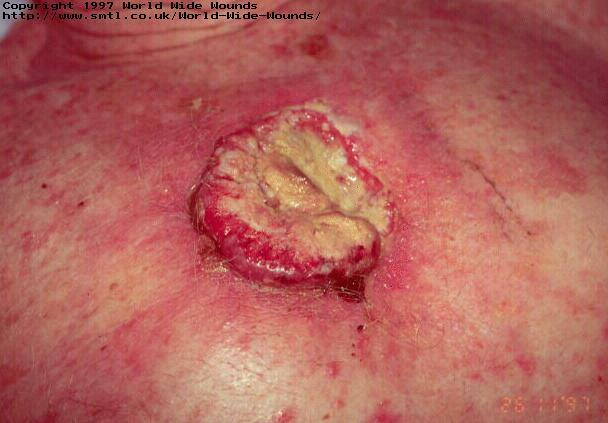 A case history describing the use of sterile larvae (maggots) in a malignant wound. This short case report describes the use of sterile larvae in the management of a squamous cell carcinoma. Mr Thomas, not the patient's real name, is an 80 year old ex-miner who retired early with emphysema. A national athlete in his youth, he loved spending time out of doors and sun-bathed at every opportunity. In 1991, a small lesion developed on the central area of his upper chest but he did not seek medical advice for this until April 1992, some 18 months later. The wound was diagnosed as a squamous cell carcinoma for which he received treatment with chemotherapy and radiotherapy. Despite these interventions, however, the wound continued to deteriorate and by April 1997 it was 50 mm in diameter. Although many conventional dressings were applied to the wound including hydrogels, alginates and hydrocolloids, by November 1997 the odour it produced had become a major problem to the patient and his carers. Larval therapy was eventually suggested to remove the slough and combat the infection responsible for odour formation. When this treatment was first initiated, the wound was 100 mm in diameter, painful, and extremely offensive (see figures 1 and 2). Figure 1 - Wound prior to treatment with larval therapy. 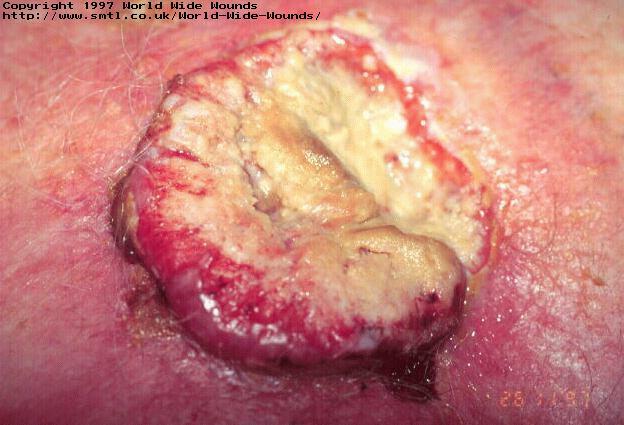 Figure 2 - Close up of wound prior to treatment with larval therapy. Two pots of larvae were applied on 26-11-97 using the standard dressing technique described previously. Two days later when the dressing was removed, despite the fact that only a small number of larvae had survived, much of the slough had been removed and the odour greatly reduced (Figure 3). Figure 3 - Wound after one treatment with larvae. Two further pots of maggots were applied which were removed on 30-11-97. At this stage the wound was odour-free and most of the slough had also been removed (Figure 4). Figure 4 - Wound after two treatments with larvae. Although the initial intention was to continue with the treatment for an extended period, Mr Thomas decided that he wished to discontinue the therapy at this stage because of pain in the area that he attributed to the action of the larvae. The wound was therefore once again dressed with a conventional dressing, an alginate sheet, changed on alternate days. 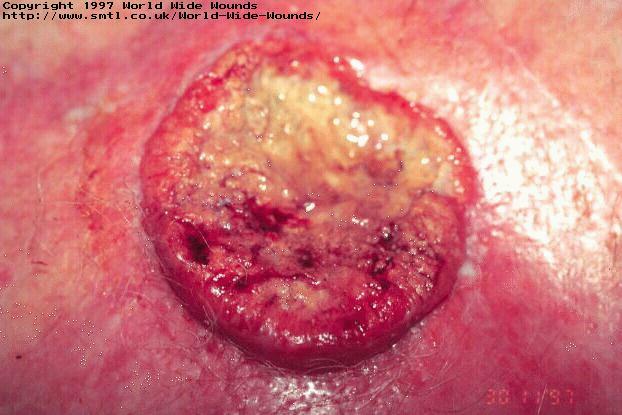 It should be stressed that although larval therapy cannot be regarded as a cure for cancerous wounds, this short case report demonstrates that it may have a role to play in the effective management of some types of malignancy. These findings are consistent with those of Weil and Bunkis who reported previously on the value of maggots in these distressing conditions. Thomas S ., Jones M ., Shutler S ., Jones S ., "Using larvae in modern wound management", Journal of Wound Care, 1996, 5(2), 60-69 . Weil G.C ., Simon R.J ., Sweadner W.R ., "A biological, bacteriological and clinical study of larval or maggot therapy in the treatment of acute and chronic pyogenic infections", American Journal of Surgery, 1933, 19, 36-48 . Bunkis M.D ., Gherine S ., Walton R ., "Maggot Therapy Revisited", Western Journal of Medicine, 1985, 142, 554-556 .